Email management is a complete waste of time. At the same time, my personal email inbox out of control. It started in the Hiptics days when I naively listed that email on the site for new music submissions. As the site took off, I was added to countless Press lists. To this day, I still get an overwhelming number of “please consider this music for review” type of messages in my inbox. It’s not the end of the world, but I often miss important emails from friends that deserve quick responses. Sometimes I go for longer-than-necessary periods of time without checking my personal Gmail because I know it is work; I know I will find a mess to clean. I have read all the long-winded articles about how to make e-mail management more efficient. I have downloaded and tried the various email applications that promise to make Inbox Zero a reality. Nothing works for my situation. Maybe you can relate? In order for this experiment to make sense, I need to establish a clear vision for what success looks like. This is it: I want to be more efficient with my e-mail time; I want to respond to emails faster. I want to spend less time thinking about email. I want more interaction and less distraction. 1. I will only check my email at designated times during the day. I don’t know about you, but I feel like I am constantly checking my inbox. There’s a psychological reason for this. E-mail initiates dopamine loops in our brain which are the root of all forms of addiction. 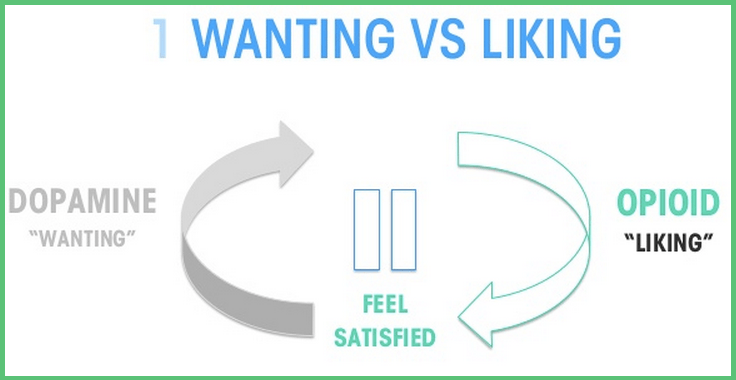 The dopamine in our brain initiates pleasure-seeking behavior. For e-mail, the pleasure comes from anticipating a satisfying message. Can you remember a time you received an unexpected e-mail with great news? The satisfaction you felt that one time causes a loop that keeps you checking your inbox throughout the day. You might wonder why we become addicted to checking our email when the majority of times there is not that satisfying e-mail. This is because the dopamine system (seeking pleasure) is stronger than the opioid system (feeling pleasure). In other words, the anticipation of pleasure is stronger than the pleasure itself. The best way to combat e-mail checking addiction is to set clear rules about when you will check your email. And I am doing that for the next 30 days. 2. I will keep my emails as short as possible. I am a communicator by nature so I tend to write long-winded emails. There’s nothing wrong with that, but for the purpose of this experiment I am going to limit the length of my email responses to five sentences of less. I actually got this idea from Google’s Eric Schmidt’s tips for being more effective with e-mail. The former CEO of Google recommends short, crisp responses. 3. I will make all emails actionable. When I read a new e-mail, I will either take action or delete it. There will be no in-between. This is going to be really challenging, but I am going to try it for 30 days. 4. I will update my e-mail signature to reflect my new personal e-mail policy. I am making some bold changes. I don’t want people to get the wrong vibe when I write a short e-mail response, so it’s important that I make it clear that there is a conscious effort to be more concise. This experiment begins October 4th. I will update this post with news along the way, and write a new conclusion on November 4th. October 11 Update: I have been at this for a week now. I need to make some adjustments. For one, I have to be really strict about when I check my e-mail. I am going to say 10am, 1pm, 4pm, and 7pm. To be fair, I anticipated fighting an uphill battle. Back in the early Hiptics.com days, I publicized my personal Gmail address. As a result, I get a heavy amount of emails from PR representatives. This requires a lot of filter management, and I feel like I spent time reducing the amount of folders, filters, and labels in my inbox. I’ve also been around long enough to know that rarely do we change the way we do things overnight. Turning my ’email management’ system around is like turning a cruise ship around. I have to be patient, and I have to work smart. October 18 Update: My inbox has become a lot more manageable because of two systems I implemented. I will share in my final recap of this experiment. 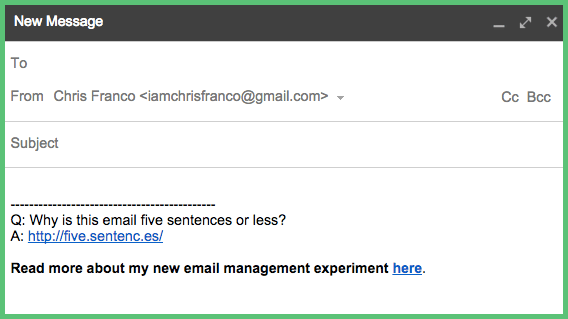 Have you tried an email management experiment of your own? Share it with me in the comments. I am the founder and CEO of Woodridge Growth. We are a growth marketing agency specializing in social media advertising. We are trusted by companies like Jet.com, FanDuel, Clarity Money, NBA Digital, SurveyMonkey and more.